The street is so clear all the locals must have been away at the All-Ireland? 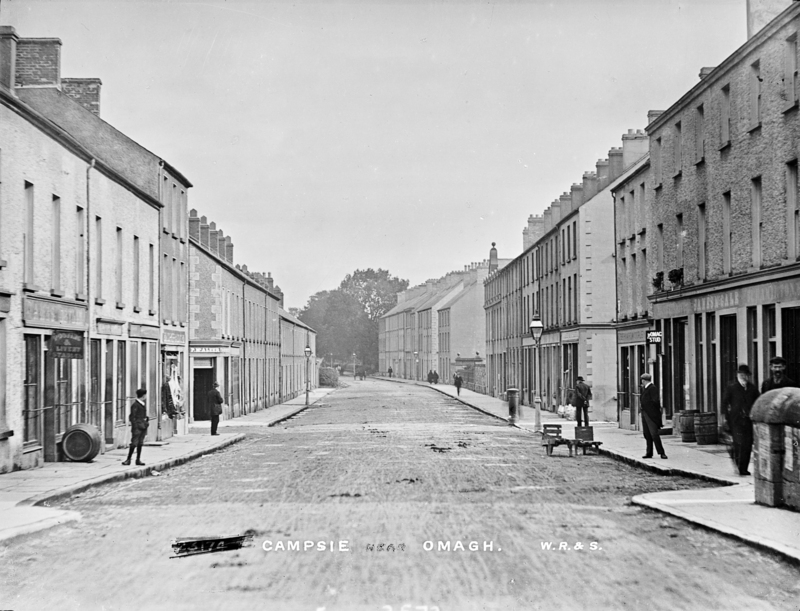 Campsie seems a strange name for a street but it appears that, then at least, this street in Omagh was known as Campsie. Interestingly the street is empty apart from pedestrians, a barrel and a couple of handcarts. Streetview. McAleers Pub is still there, despite having been bombed in 1972. Peter McAleer in the 1901 census. The few people are looking at Horse drawn carts arriving in the distance. W. R. & S. - I always forget - weren't they around 1903 -1905 ? McGale's and "The Omagh Stud" are on Market St., rather than Campsie Road. James McGale is in the 1911 census as a Grocer and Baker but he's still on John Street with in 1901. In 1901 Armour J MacFarlane is working as a photographer while his father William is a Grocer and Merchant. However in 1911 they are both working as photographers. (Hence the Omagh Studio, I presume). Wow, not a single car in sight - bliss. Three people not wishing their faces to be recorded, or was it coincidence? Can't get over the 'vehicle free' road!